This healthy “good gut” green smoothie is an easy way to get a good dose of nutritional powerhouse ingredients that contribute to overall good health. 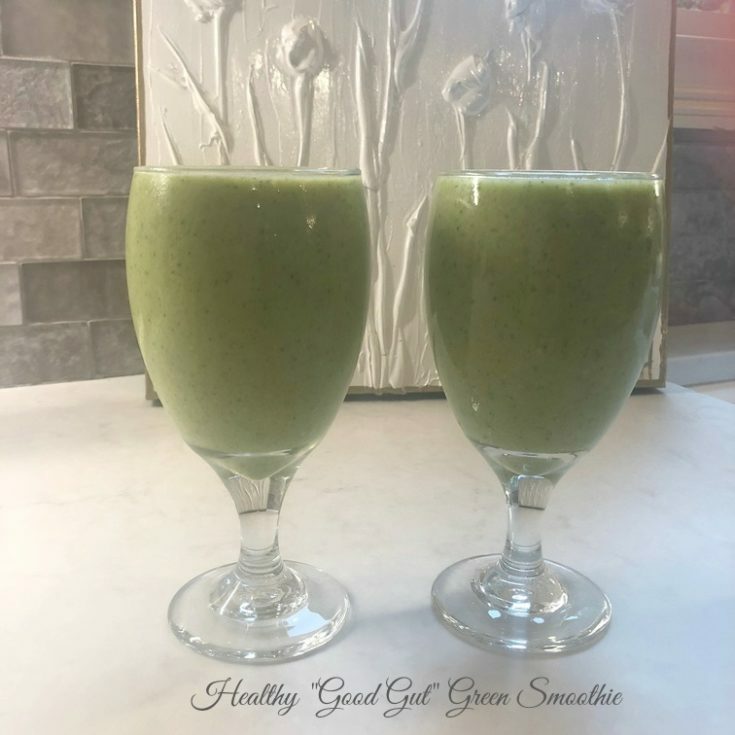 This healthy good gut green smoothie is what Zane and I are drinking right now to incorporate several powerhouse “detox” ingredients into our diet. Since smoothies are an easy way to get everything at once, we love just getting our health fix in the morning and feeling great about our day. Ginger. Fresh ginger is anti-inflammatory, anti-nausea, and has additional health benefits. Turmeric. Read all about the benefits of this nutritional powerhouse here. Cinnamon. The health benefits of cinnamon are laid out in this post by Dr. Axe. Probiotics. 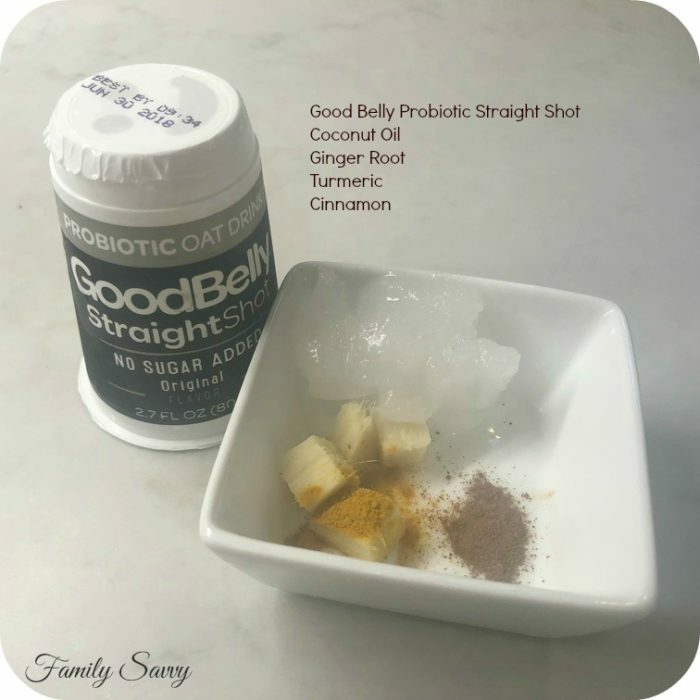 These help increase healthy gut flora as well as additional benefits. I love Good Belly shots and use in this smoothie. Go to goodbelly.com for more info as well as coupons for free shots. Coconut Oil. Despite the negative press it can get, I take this daily~in my coffee and in smoothies. Dr. Mercola share his take on coconut oil here. Below is a visual of all the ingredients listed above. Note that the ginger root is basically a small slice cut into squares; it will chop completely once blended. This smoothie might take some getting used to, as it has no artificial or added sugar. You can certainly tweak this to your liking, but you might drink this a time or two to see if you don’t acquire a taste for it. I did that with this smoothie (and my fave Kombucha) and now I crave them both. Note: Smoothie consistency can turn out differently based upon myriad factors, namely the ratio of liquid to frozen ingredients. Too thicken a smoothie, add ice and/or frozen fruit. To thin a smoothie, add more liquid. So, here is the recipe for the healthy “good gut” green smoothie that Zane and I are addicted to drinking in the mornings. If you try this or make your own version, please share in the comments! As always, thanks so much for stopping by. Here’s to a healthy, blessed & savvy day!!! Place kale & spinach in blender. Add frozen mango, pineapple & banana. Pour in almond milk and Good Belly shot. Toss in ginger, coconut oil, cinnamon and turmeric. Add ice if needed or more almond milk if too thick. Thank you! I havenâ€™t tried kombucha yet but have been wanting to. Thank you for suggesting a kind! I also like the Gingerberry kombucha from GT. Today I bought a different brand to try (on sale): Kevita. I got the Lemon Ginger and the Lemon Cayenne flavors. Thank you, Jamie. I did search at their website and came up with only a link to order the capsule. I’m in a small town with limited resources. So if a capsule would work (I saw on Amazon in the reviews that someone opened the capsule to help in the making of beer), then that would probably be the best and longest lasting product for me to use in this smoothie recipe. Thanks, again. Hey Aline! I love the GT Kombucha in Synergy, Trilogy, and Gingerberry (the least sweet)! What is your fave? Hi Robin! Yes, it serves two (the photo was our two servings). I would think that a capsule would be fine…..I am surprised you can’t get the Good Belly locally. I suggest you go to their website and do a search and also ask your grocer to carry. Let me know!! Hello. Thanks for this smoothie recipe. I assume it serves two, right? Also, can I use a capsule of the Good Belly probiotic, as it seems I am unable to get the liquid locally. Which Kombucha is your favorite?